This holiday season open the door to delightful vintage reindeer. 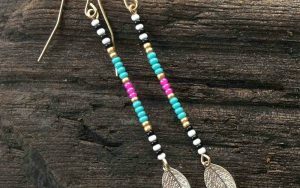 It’s our favorite time of year for flea market shopping. Vendors dig out all the Christmas goodies they’ve gathered throughout the year and create elaborate displays that are so inspiring! Just browsing the stalls reminds us of Christmases past and gets us excited about Christmases future. 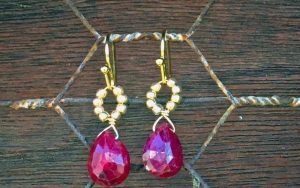 While we oohed and aahed at all the nostalgic shiny ornaments and felt stockings, what really tickled our fancy were the herds of reindeer, and let’s just say it didn’t take us long to start a brand new collection. 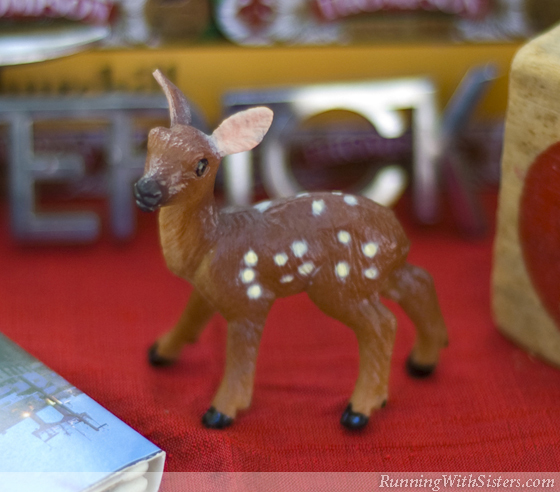 To get a jumpstart on our deer menagerie, we each bought a tiny Bambi figurine to display in a winterscape under a bell jar. Jennifer discovered a trio of red velvet-flocked reindeer just like ones we had as kids, and got them for $3 each. She plans to name them Dasher, Dancer, and Prancer, and mix and match them with all kinds of other reindeer on her mantle. Kitty was looking for something bigger and spotted a family of lawn deer in one vendor’s booth. We decided they’d be darling nestled together on a snow-white blanket under the tree. The price of $44 for the whole set was quite a deal for such a large focal piece. And who could resist those big doe eyes!? One of the best finds of this trip was an old-fashioned push sleigh featuring a reindeer figurehead. 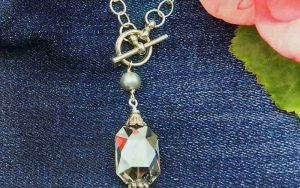 Jennifer said it reminded her of black-and-white, Victorian postcards, and she could just picture a child dressed to the nines bundled up in the sleigh. Kitty thought it would look festive loaded with wrapped Christmas presents. Alas, although old sleds can be found pretty regularly at winter flea markets for about $50 to $75, antique child sleighs are less common and can cost from $500 to $1000—too rich for our blood. 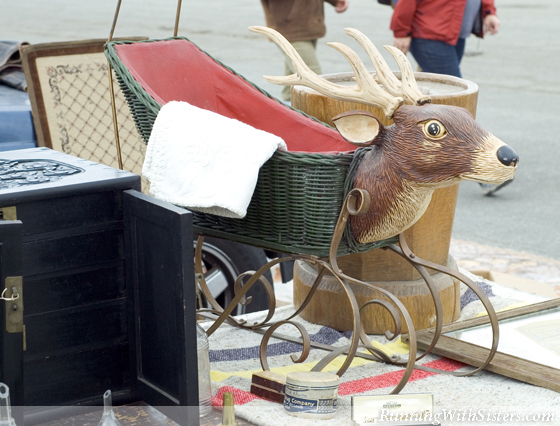 But it’s easy to imagine an eye-catcher like a buck-head sleigh becoming someone’s much-loved holiday tradition. 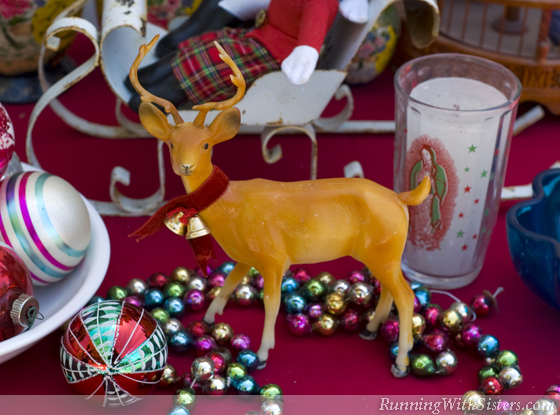 No tour of swap meet reindeer would be complete without a nod to Rudolph The Red-Nosed Reindeer. 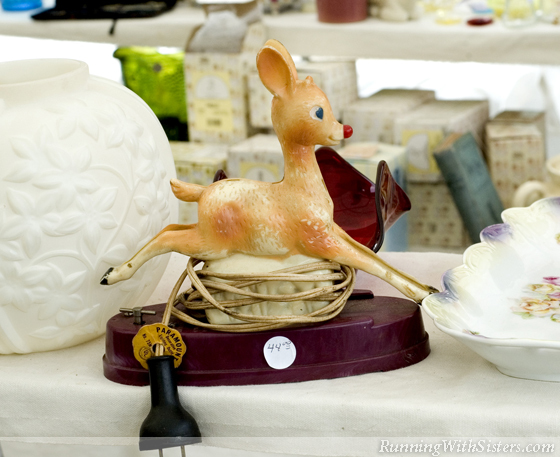 The 1939 story spawned lots of Rudolph tchotchkes that would be wonderful to showcase during the holidays. 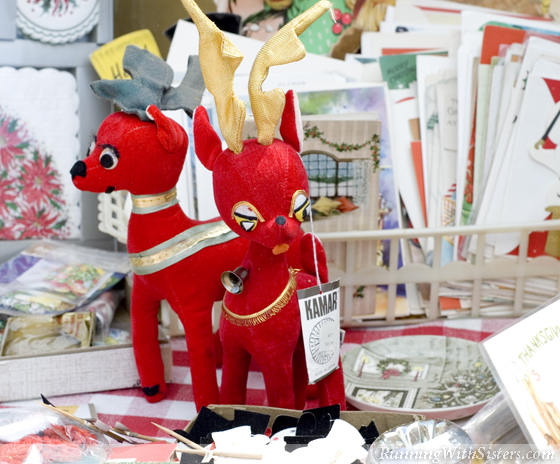 At this flea market, we saw plenty of little plastic reindeer with red noses and even a handcrafted felt Rudolph with a red jingle-bell nose. 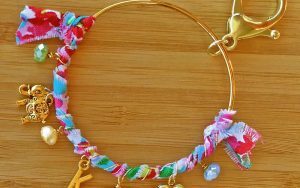 We think they’d be great in a shadowbox table with some flatter items. Maybe we can find a copy of the old Gene Autry record with the cartoon of Rudolph on the cover! Memorabilia from the famous 1964 stop-motion animation of Rudolph The Red-Nosed Reindeer is also showing up at flea markets. And while you probably won’t run across the original puppets of Santa and Rudolph, it’s not hard to find newer ornaments, figurines, and even cookie jars from this classic Christmas special. We were lucky enough to get a Hallmark Keepsake ornament featuring Bumble the Abominable Snowmonster for only $13. Decorate with anything Rudolph, and you’re sure to have a holly jolly Christmas! 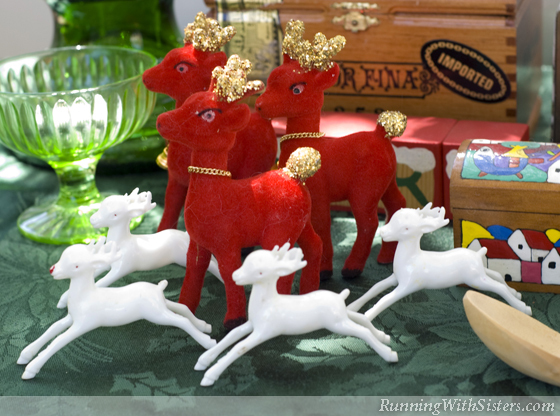 When it comes to vintage Christmas collectibles, we love the look of regal reindeer made of molded celluloid, a lightweight plastic that was developed as an alternative to ivory. 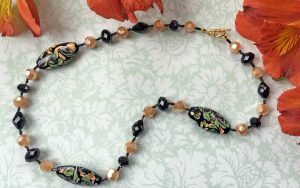 Many of the delicate critters were made in the 1940s, and those that have survived the decades have become highly valuable. A celluloid Santa could cost over $25, but you can find individual reindeer for under $10 each. A complete set of deer pulling Santa’s sleigh might be as much as $100, but as a Christmas centerpiece, it’ll be priceless!